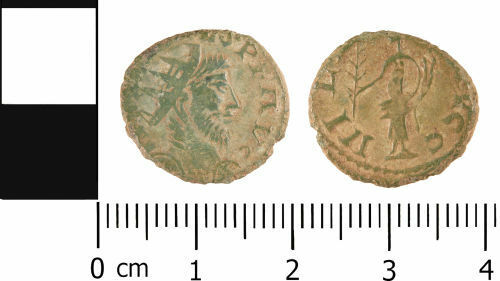 A copper alloy barbarous radiate, copying Tetricus I (AD 271-4), dating to c. AD 275-85 (Reece Period 14), HILARITAS AVGG, Hilaritas standing left with palm and cornucopiae. Prototype from Gaul Mint I. Cf. Normanby, p. 207, no. 1956.